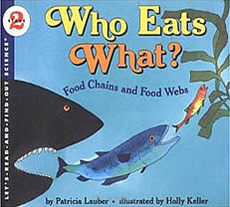 A straightforward early introduction to food chains for kids -- in the ocean and on land. Readers learn about the food chain from basic plants and simple organisms all the way up to humans. This book is part of the fabulous Let's Read and Find Out Science series! Detailed enough to teach scientific concepts but not too detailed that it risks losing young readers. Covers the food chain in the wild and brings it closer to home by encouraging readers to draw the food chains for the things they eat. Booklist called it "informative and intriguing." Agree. Holly Keller's watercolor drawings are cute and help to clarify the concepts. This book was a National Science Teachers' Association Outstanding Science Children's Book in 1996! Okay, weak! This is the only interior page we have so far for this book. We're working on adding more. Promise! This should give you an idea though, right? If you like this book, check out the Let's Read and Find Out Science series. (This book is part of the series). We really like this series! The authors and illustrators do such a good job of taking complex science subjects and putting them into kid friendly doses and language! They are definitely worth checking out. You can learn more about these books by clicking on the book covers below or the link above.